GM, the largest overseas automaker in China, reported a 9.9 percent rise in June sales, ending two consecutive months of declines as solid demand for its more upscale Buick and Cadillac cars offset weak mini vehicle sales. BEIJING -- Car sales in China rose 6.2 percent in June from a year earlier, reversing a decline in May, helped in part by the improved availability of Japanese cars as automakers such as Toyota Motor Corp. gradually recovered lost output. The world's largest auto market will likely remain sluggish in the summer followed by a mild rebound in the autumn when the high season for car sales kicks in, industry analysts said. "We will see more Japanese cars in showrooms across the country in coming months as parts production improves in Japan," said Sheng Ye, associate research director for Greater China at industry consultancy Ipsos. "But July and August will still be challenging for automakers because demand has always been relatively tepid in the summer." 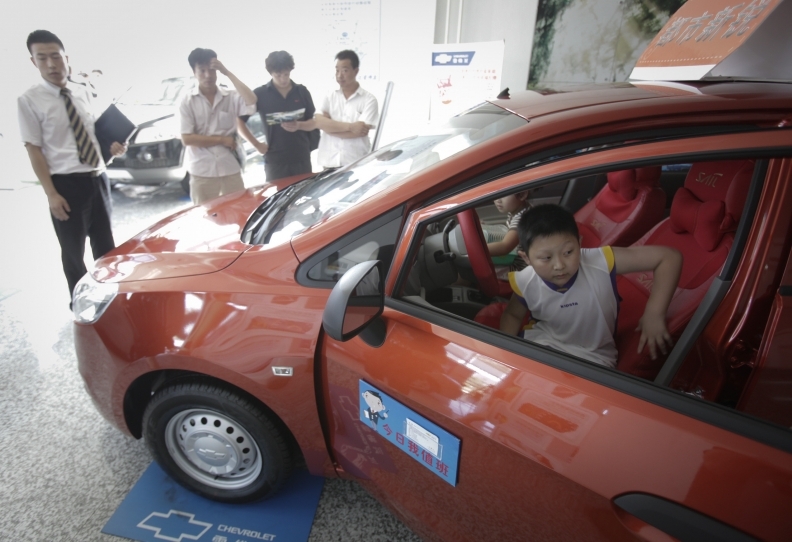 China's once-sizzling auto market has cooled significantly after the government stripped away most of its policy incentives for the industry at the end of 2010. Car sales declined for the first time in more than two years in May, prompting some industry insiders to downgrade their forecasts. Dong Yang, secretary general of the China Association of Automobile Manufacturers (CAAM), said he now expects 5 percent growth of overall vehicle sales in China for 2011, down from his earlier forecast of 10 percent to 15 percent. However, Kevin Wale, president and managing director for GM's China operations, is more optimistic. The slowdown is temporary, he said. Demand would recover in the next six to 12 months because the economic fundamentals of the country remained strong. In June, 1.11 million sedan, SUV and multi-purpose vehicles were sold, the China Association of Automobile Manufacturers (CAAM) said on Friday. Sales in the first half rose 5.8 percent to 7.22 million units, CAAM said. In June, Toyota's China sales slipped 2.4 percent from a year earlier, improving significantly from a 35 percent fall in May and a 23.5 percent decline in April. General Motors Co., the largest overseas automaker in China, reported a 9.9 percent rise in June sales, ending two consecutive months of declines as solid demand for its more upscale Buick and Cadillac cars offset weak mini vehicle sales. Ford Motor Co. maintained its growth momentum with an 11 percent monthly gain as it expanded its network in smaller inland areas. Warren Buffett-backed BYD, however, extended its losing streak with sales for the month down 8.2 percent year on year. The U.S. auto industry sputtered to its second consecutive month of weaker-than-expected sales in June, marked by disappointing results from GM, Ford and big Japanese automakers, as the weak economy and tight supply of cars left buyers wary. New vehicle sales in Japan slumped by more than a fifth in June as production disruptions from the March earthquake lingered, but data showed a big improvement from the previous months as more parts became available. In neighbouring South Korea, Hyundai Motor Co. and Kia Motors Corp. extended their strong run with double-digit growth as Hyundai ate further into the market share of Japanese carmakers. After China sales hit a multi-month low in May, market sentiment has started to warm in June in a country where more than 70 percent of vehicle owners are first-time car buyers. The positive atmosphere has also helped push up auto stocks across the board. Shares of Warren Buffett-backed BYD Co. Ltd. surged more than 40 percent on its Shenzhen debut on June 30, despite reporting an 84.4 percent drop in first-quarter earnings the previous day. Shares of state-owned auto groups SAIC Motor Corp. and Dongfeng Motor Group Co. have been on an uptrend, gaining 8.2 percent and 11.7 percent, respectively, since the beginning of June. "Sentiment is turning more positive now," said Liu Lixi, an analyst with Northeast Securities. "Most auto stocks did not do very well in the first half, but investors are coming back again, betting on their growth potential."